Wind power is becoming one of the major energy resources of the future. Wind Energy offers a major forum for the reporting of advances in this rapidly developing technology with the goal of realising the world-wide potential to harness clean energy from the wind. Progress in Photovoltaics offers a prestigious forum for reporting advances in this rapidly developing technology, right through from research to practical application, and aims to reach all interested professionals, researchers, and energy policy-makers. 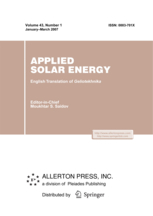 The journal's Editorial Board is drawn from many countries with a deliberate balance of interests between research, industrial development and practical operation of PV systems, and plays an essential role in the refereeing of contributions.